We are pretty lucky living in Walterboro which is so close to many wonderful destinations. Drive in any direction for just a few hours to find great experiences. Savannah, GA is one of those destinations that we love to visit for a day and on occasion a few days. There is always something new and different and in a week we’ll go for the highly successful Savannah Book Festival February 14th through 17th. Picking out authors tables to visit at the Savannah Book Festival. Last year over 10,000 people attended. Add that to other events those days in the city plus Valentine’s Day (When all men feel guilty!) and hotels are premium priced if they even have rooms available. Saturday is the busiest day for the Festival when 40 authors speak in venues and book signing abounds around Telfair, Wright, and Chippewa Squares. It is free and open to the public. But if you don’t make it this year it’s easy to build your own literary tour of the city. Start with the book Literary Savannah edited by Patrick Allen that lists 37 authors and their connection to Savannah. 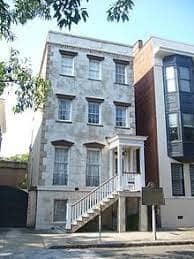 Stop at the Flannery O’Connor Childhood Home 207 East Charlton St. and take the guided tour ($8 pp). They are open every day but Thursday but be sure and call to check the hours. This is a wonderful depression era home worth seeing in its own right but especially superior because of the stories about O’Connor’s life and her family. I’ve done the tour twice and learned something new each time. 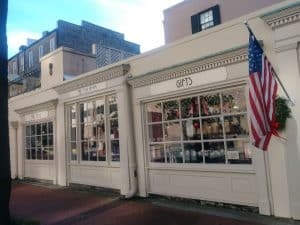 Savannah’s E. Shaver Books and The Tea Room. Two book stores worth visiting are E. Shaver, with its tea counter on Madison Square since 1975 and Book Lady Bookstore a highly rated and recommended new and used book store since 1978 at 6 East Liberty St.
Savannah also has a large number of antique “malls” and thrift stores that are usually a treasure trove for book lovers. One of the cities more popular guides Mike Mack, info@noblejonestours.com, can tailor a private guided tour to follow any special interests you might have including literary. During the Festival there will be food trucks around or near Telfair Square. Plus The Grey Market will have special box lunches at $8. Since 1919 everyone’s favorite ice cream store plus lunch! Leopolds at 212 East Broughton St., the Savannah Institution since 1919 for ice cream and other great food will have their Ice Cream Cart out and the restaurant will be open. In general there is always a line to get in for sit down eating or just to get a cone. Obviously worth it! A short walk to Vic’s on the River which is always good. John Morisano and Mashama Bailey opened The Grey in 2014 (dining restaurant not their market) and immediately landed themselves and Savannah on the national food map receiving a number of accolades. Now perhaps you want to stay over? Well with big crowds expect to pay top prices and inexpensive $70 motels jump to $140. Real literary aficionados booked their rooms at the end of last year’s festival. Living less than 70 miles away we’ll just attend Saturday and drive in during the morning and back home at night. Bright and cheery rooms at the Marshall House. 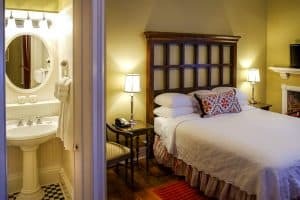 My recommendation and most recent experience regarding hotels in Savannah for anytime are the Historic Inns of Savannah Collection and in particular the 1851 Marshall House at 123 East Broughton St. in the heart of downtown and walking distance to most everything plus it was voted the number one hotel in Savannah. With only 68 rooms it is frequently sold out. I stayed here for two nights over Christmas and had such a wonderful time, met many great guests at the wine and cheese hour and was catered to by the happiest most caring staff. Even the waitresses at what they call their “continental breakfast” (tons of great food buffet) were happy. One older couple must have loaded 2 lbs of bacon on their plates! (Doing Keto anyone?) Everything was kept full, fresh and hot, even the bacon! 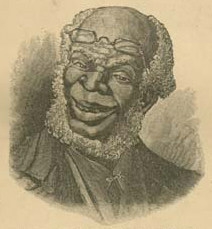 The “real” Uncle Remus not from the Disney movie! literary theme on this trip as a resident for several years was Joel Chandler Harris, author of my all time favorite children’s book series Uncle Remus. Next time I’ll ask for room 402 or 403 one of which was his room. Enjoy Savannah, GA, an exceptionally beautiful and bountiful city! Featuring history, culture, fine dining and superb scenery. This article was first published in the Press and Standard Newspaper.